Follow up overdue payments with an informal but effective letter debt collection letter or otherwise called a “Final Notice” or “Letter of Demand”. 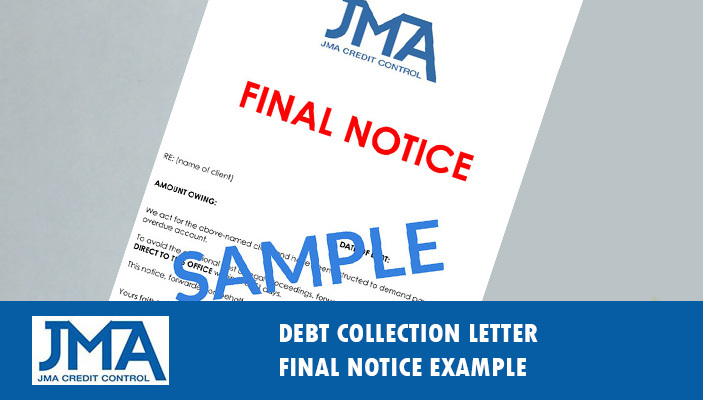 If you’re wondering exactly how your debt collection letter needs to be worded then JMA Credit Control is happy to help. A letter of demand is usually sent when you have tried unsuccessfully to get your debtor to pay an outstanding invoice and there is no choice but to take more serious actions. Our final notice example can be sent to your debtors as a final opportunity to make payment before you employ a professional debt collection agency to take over. The wording of the letter is clear, so your debtor has no trouble understanding the contents. The letter is firm, so the sense of importance is also clearly conveyed. The debt collection letter can prove to be a useful final tactic to get the debtor to pay up. Before sending your letter of demand, it may help to get some advice from someone who has had experience with debt recovery and a proven debt collection process. JMA specialises in debt recovery and we’ve been helping businesses recovery outstanding debt for over 50 years. We have in-house lawyers who will also provide legal expertise to ensure that you give your business the best chance to recover any outstanding amounts. Contact us for a no obligation consultation about how we can help your business and take the stress out of collection. Feel free to use our debt collection letter in conjunction with our debt collection tips for the best results in debt recovery. Complete the form below and you will receive a link to download the debt collection letter.